This season began socially with family from New Zealand sailing with us from our base in Langkawi, Malaysia to Phuket in Thailand. There friends from Romsey joined us for Christmas and New Year where. We introduced them to the many attractions of that beautiful area studded with islands, white sandy beaches and dramatic karst limestone structures jutting from seascapes. The festivities behind us, we set off into the Indian Ocean for the Andaman Islands which are part of India, some 400nm to the north west. You can see from the Google Earth image that the sea bed is somewhat littered with ridges and sea mounts as one approaches the islands. The major ridge has exposed rocks on the rhumb-line and much of it is less than 40m deep, all of which leads to confused and bumpy seas. However, much to our surprise, the winds were much more accommodating than we had expected. After three nights at sea with only around three hours under engine we arrived off the entrance to Port Blair, the only large town in the Andamans and single point of entry. This long chain of islands are known as the Nicobar and Andaman Group but the Nicobars to the south are inhabited mainly by savage tribes, with no access permitted. There are many tales of fisherman who were forced to take shelter there getting no further than the beach before being felled by poison tipped arrows. 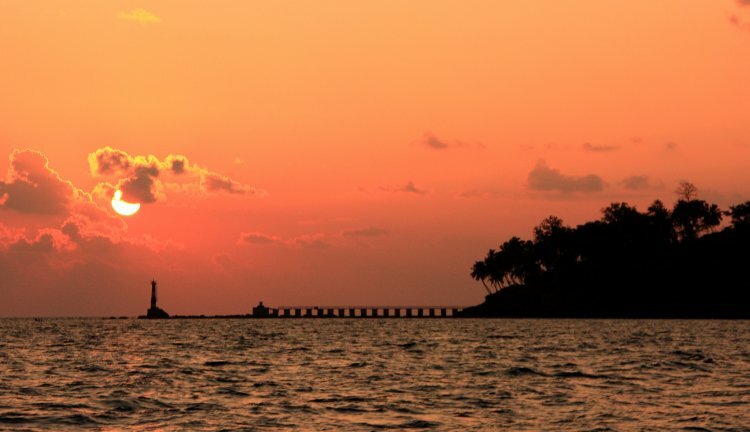 Port Blair is a wonderful natural anchorage but renowned for the most time consuming and complex bureaucratic hurdles that visiting cruising vessels face almost anywhere in the world. 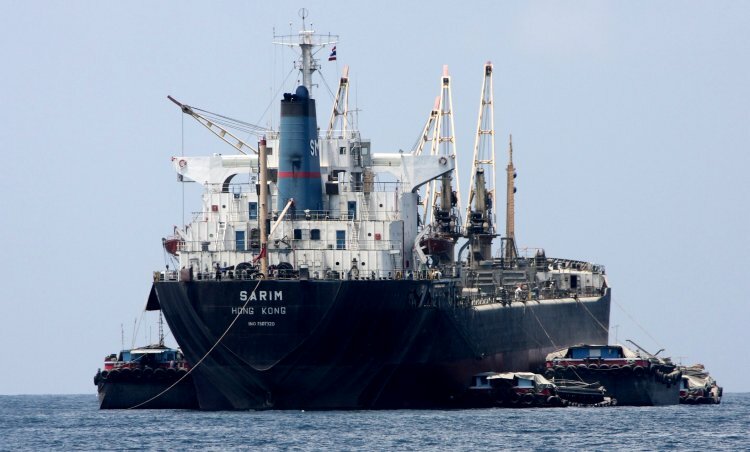 It has not been unknown for boats to take between two to seven days to clear through the various elements of immigration, customs, coastguards and harbour master. During this time you must remain aboard, all of which is included in the 30 day maximum stay allowed in what they term a 'Specially Restricted Area'. Not only must the harbour master personally approve your intended itinerary within the islands but then you are required to report in twice a day by HF radio. Arriving so early on a Wednesday morning were lucky to be through the whole process in just over a day. Each group of officials arrive in force, customs and immigration having no boat, have to be picked up from a dock over a kilometre from the anchorage. The coastguards come alongside but complete in duplicate the most involved and complicated document imaginable (one person for each form). They also bring with them a technical specialist from the Indian Navy whose task it is to ensure that we are not secreting aboard some form of bottom profiling sonar equipment. This seemed strange and they were sensitive about discussing the reasons for this apparently paranoic concern. However, there are suspicions that this may be linked to a Soviet naval base that was sited in the islands to the south during the cold war period. 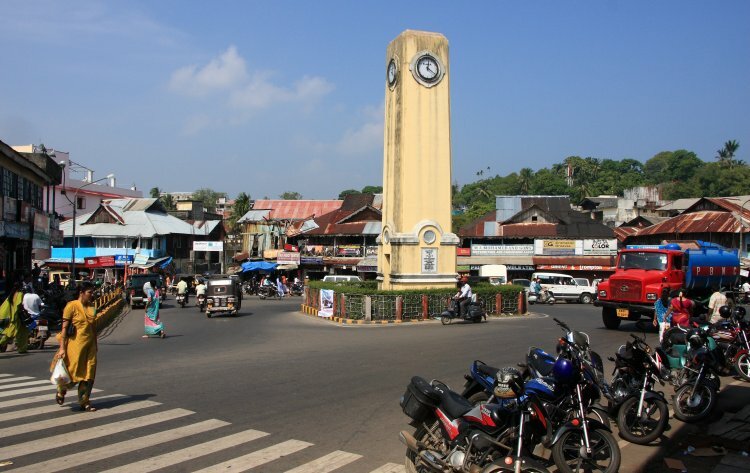 Port Blair was named after Lt. Archibald Blair who in 1788 was commissioned by the East India Company to locate a suitable port that would sustain a settlement on the islands. It is a bustling town that reminded us very much of the north east area of India we had recently visited on our way back from Nepal. Overcrowded, run down, dirty, smelly and most of all noisy. Below is a non typical, relatively orderly scene at the centre of the town's Aberdeen commercial district situated at the top of a long hill. The people are very friendly but finding the usual provisions we get easily in SE Asia proved difficult as local tastes are very different and there were no supermarkets. Nevertheless, with the help of local taxi and tuktuk drivers, we soon became proficient at locating most of what we needed in the various small shops, markets and bazaars. 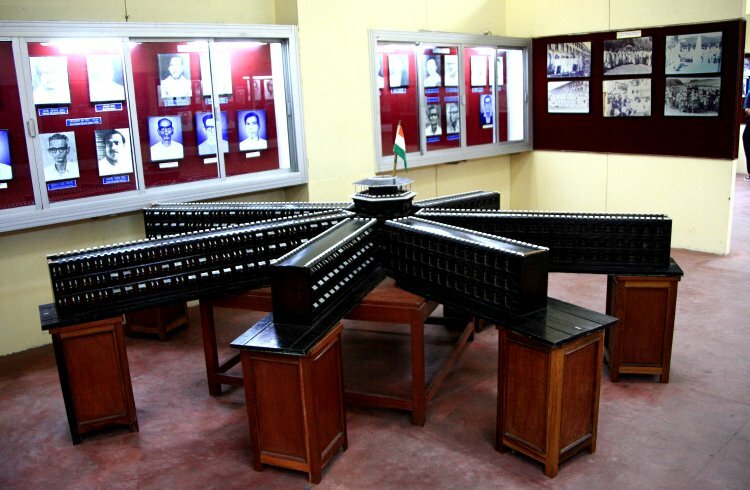 There is not a great deal to do and see in the town aside from a National Monument dedicated to the jail where around 200 political prisoners and freedom fighters from the Indian quest for independence were incarcerated. Initially the port was intended to be run as a trading centre on the lines of Penang but following the Indian rebellion of 1857 became a penal colony for prisoners of all types transported from mainland India, what is now Pakistan and Burma. 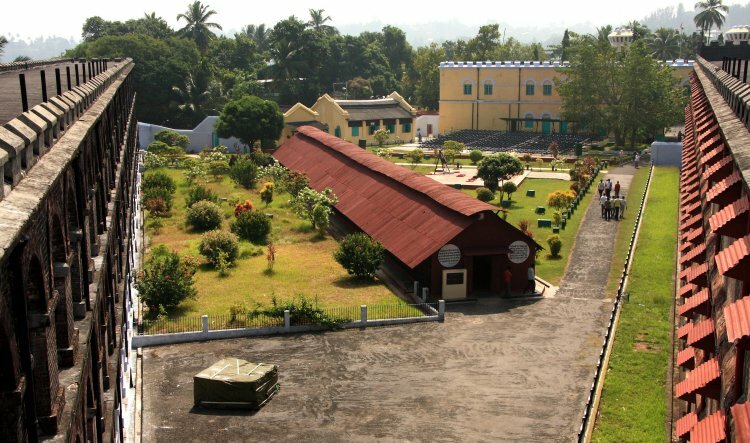 The most celebrated site is the Cellular Jail modelled below which was begun in 1896 and occupied in 1904. It became one of the murkiest chapters in the history of colonial rule in India. Now just three of the original seven wings remain as a memorial to the struggle leading to independence in 1948. The Port Blair area seemed popular with tourists from the mainland who flew over on relatively short tips of 3-5 days, so this national monument was a well attended attraction. Below is the view from the central hub between two of the wings with the seating area for the night time sound and light show visible at the back. Painting of the prison walls was in progress, a somewhat messy process, especially if you were observing from below. Note the high tech suspension system for the painter which we are sure conforms to all the local health and safety at work standards. 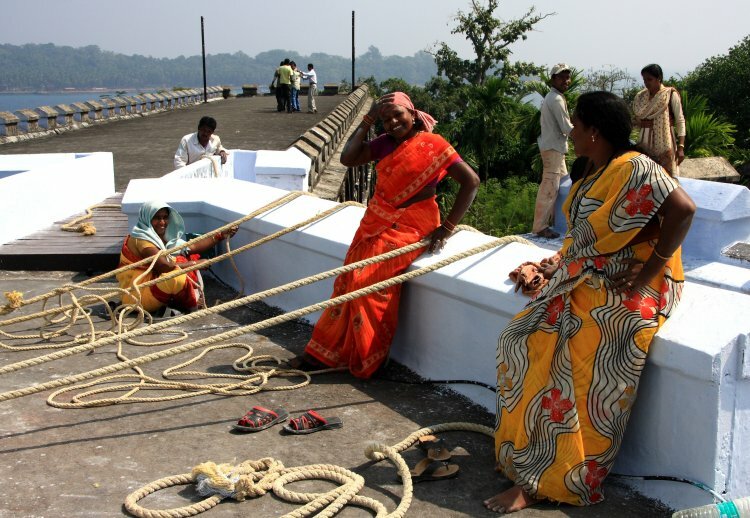 Here you see the support team who suspend the guy painting the wall, manipulating the ropes as he progresses with the job. Bet he does his best to keep on the right side of this colourful trio of beauties. Probably the most interesting historical site in the area is Ross Island which commands the entrance to the port. 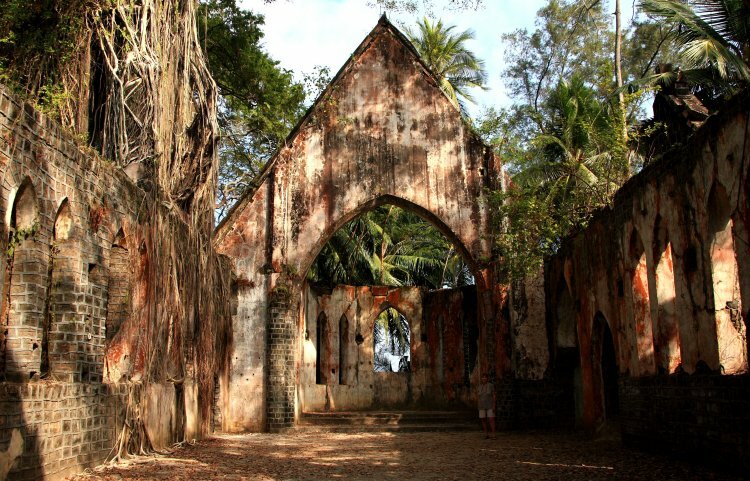 In the time of the Raj it formed the administrative heart of the islands, so sited as there were so many prisoners housed around the town, that the administrators sought security in an off-shore island retreat just a fifteen minute boat ride away. The islands were occupied by the Japanese in 1942 who used Ross as their headquarters. 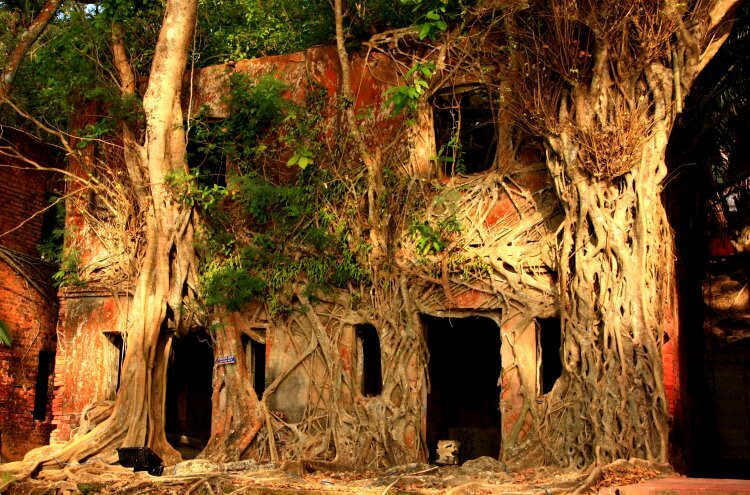 After the war the island was abandoned as a settlement, the many buildings and barracks falling prey to rampaging nature. It is now an attractive place to visit, wandering around in the shade of huge trees, attempting to visualise the then sumptuous life-style in the governor's residence, officer's messes, swimming pool and cricket pitches. Below are the remains of the church, the high tower of which on the LHS is totally encased in vines. The island derived it name from the illustrious marine surveyor Sir Daniel Ross. and was first settled on 10th March 1858. Much of the timber from the structures was taken for use in the town after independence. These buildings with their gaping orifices were officers quarters just 100m from the shore facing west toward the mainland. 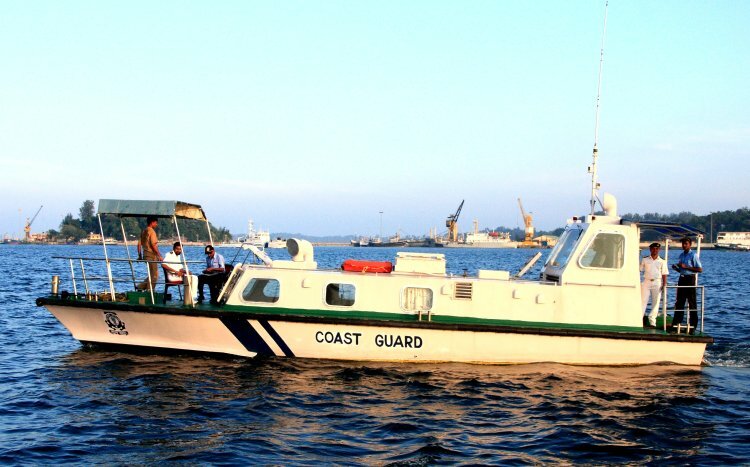 Our immigration permit allowed us limited access to the 'Special Restricted Area' within around 40nm of Port Blair where there are numerous bays and islands. Navigation can be tricky though as the charts are not accurate and the whole area was not only devastated by the Indian Ocean Tsunami of 26th December 2004 but the land was tilted with sea level changes claimed to be as much as 2m in places. Fortunately for us, our main area of interest on the eastern side had gained water depth but it was rumoured there remained a number of unmarked wrecks. These trees below in the bay at Chiryatapu, south of Port Blair were probably destabilised and overtaken by the waters due to this sea water rise. They made a suitable perch for these children on a school trip. Several groups turned up there by coach, all happy to leap into the water in their uniforms. Chiryatapu is a small and somewhat remote community served by only one small store. 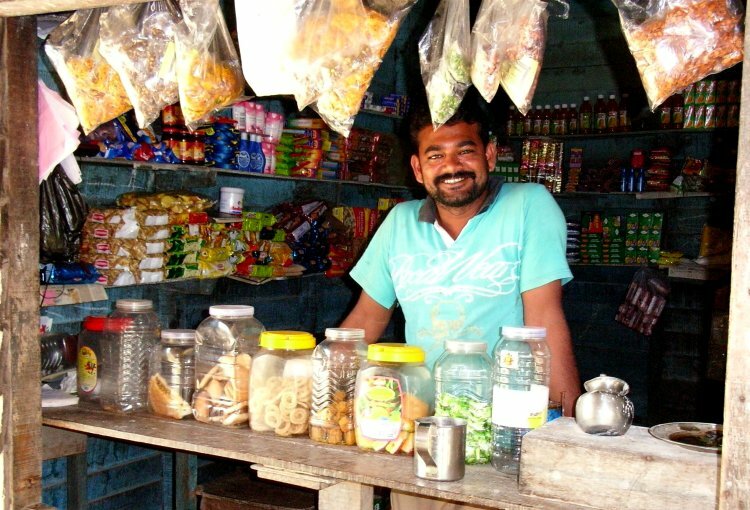 Obviously the owner looks pleased to see new customers but sadly the collection of dry goods had little appeal for us. Like the vast majority of stores in poor countries, it was stocked with the usual pile of unhealthy confectionery, biscuits, crisps and carbonated drinks. Hopefully economic development will bring more than just these trappings eventually. 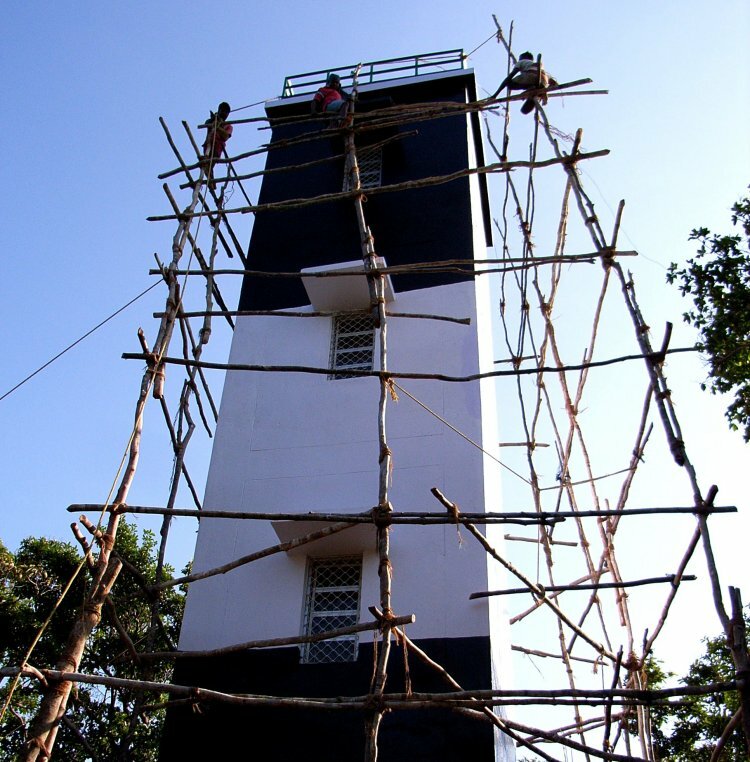 A long track from the bay in Chiryatapu led up to the site of a new lighthouse overlooking the entrance to a channel on the southern side of the main island. The building had just been completed and the somewhat precarious looking scaffolding was being removed. At the same time a team of porters were toiling up the hillside carrying all the heavy electrical gear to be mounted inside. It was staggering to pick up one of their loads to discover what these relatively slightly built guys were capable of transporting. 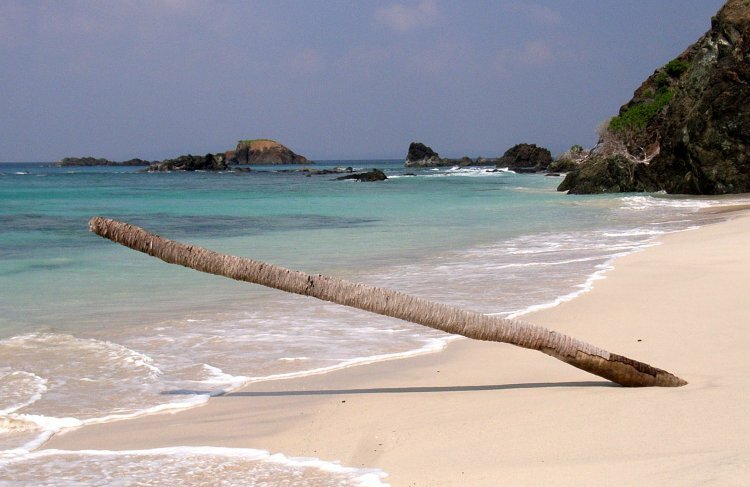 Further south are the beautiful Cinque Islands with lovely beaches and many off-lying reefs with good snorkeling. Though the water was often not as clear as one would have liked due to the wind disturbed seas, the marine life was excellent as there are relatively few visitors to these remote spots. 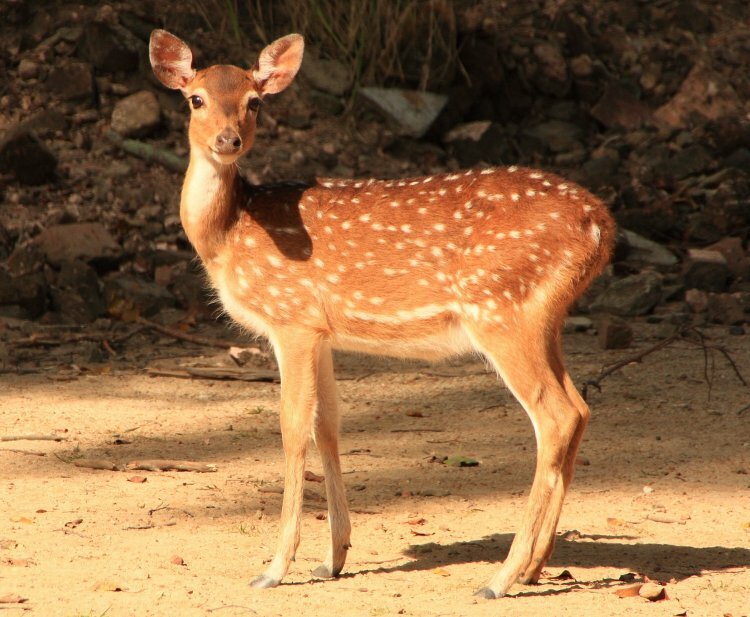 We could sit for hours at anchor gazing out over the beautiful remote landscape, often getting a view of groups of the indigenous spotted deer. Here is a lovely young specimen that was just tame enough to get within telephoto lens range of on Ross Island. Generally one tended to think we had these remote islands to ourselves but often we found small wooden fishing boats hidden away in creeks with two or three guys aboard. This young lad about to cast a throw net was on Henry Lawrence Island in one of the northern group. The fish life around the islands abounds but sadly we had no success on the few occasions we towed a lure. The beach below on Havelock Island was voted the best in all Asia by Time magazine but those of us who have greater access to more remote places would hardly agree. One afternoon there the tranquility was lost to the impending arrival of a visiting VIP, preceded by the now to be expected panoply of security preparations including dog searches and metal detectors, all accompanied by automatic weapon toting police and troops. The dignitary in this case was the Lieutenant Governor of Delhi, Shri Tejendra Khanna and his wife who were there on a brief visit. As they were standing right beside our canoe, 'Yellow Peril' just as we were about to depart for Amoenitas we thought we should introduce ourselves. The security detail were horror struck but all was well and after a brief chat the head of security even took this picture of the four of us. 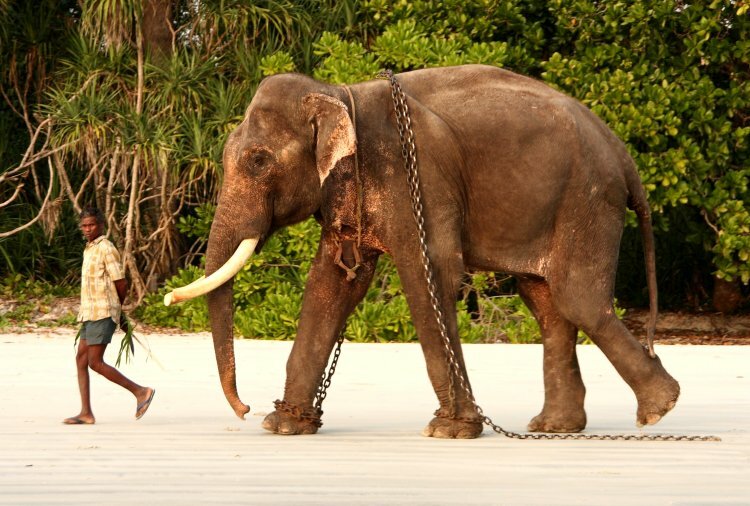 Havelock Bay has one remarkable inhabitant, Rajan the elephant. 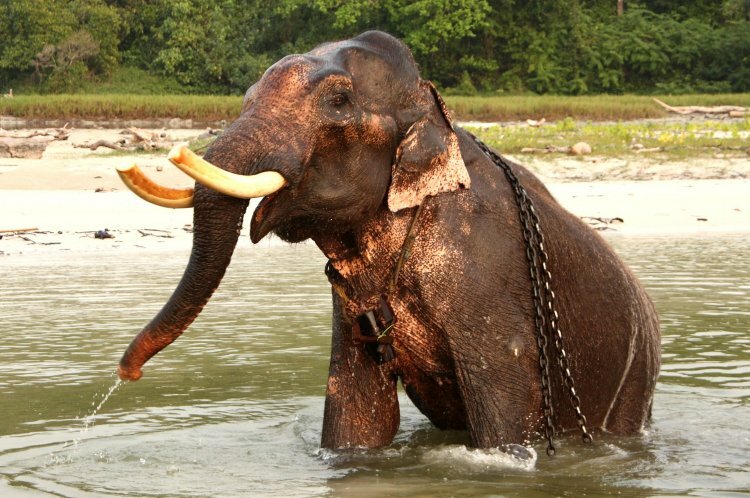 He is 60 years old and one of three remaining elephants of ten trained to swim in the sea when logging was carried out in the Andamans around 20-30yrs ago. They were used to push logs out to barges waiting off-shore. The other two have been released into the wild and no longer swim. When his original trainer died of a cobra snake bite Rajan refused to respond to any commands but now his new guardian Naju has gained his confidence. One evening we were fortunate enough to spot Naju leading Rajan along the beach on his way back from some light duties in the forest. He loves his evening bath in the creek of a river just by the beach. He even gets to be scrubbed behind the ears. 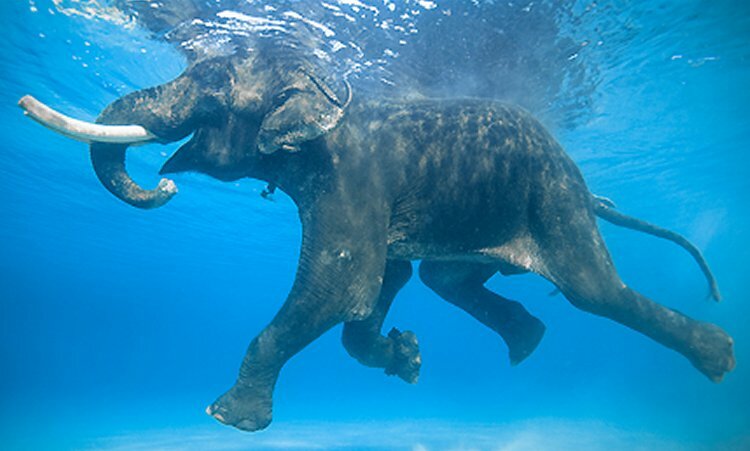 He swims like a dog, using his trunk as a snorkel. It is very rare for elephants to swim in the sea and the training to do it was very coercive, if not cruel. He may be the only one of his specie still swimming in the sea which he usually does early in the morning, at around 6am. Thanks to the power of the Internet we where able to find this picture of him swimming. Back in Port Blair around the the 1st February we experienced a somewhat strange Hindu religious festival that no one we knew could name for us but just said it was a local celebration. 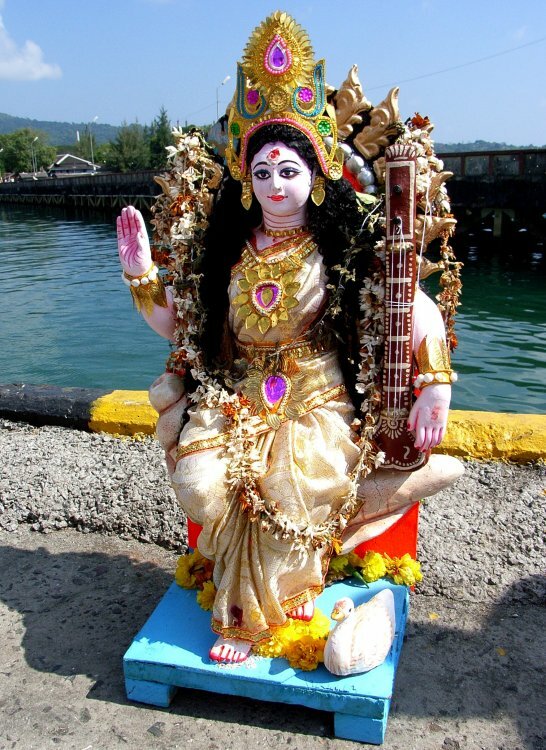 Groups ranging from families in a car to coaches with school or other groups would arrive at the dock side bearing these large ornate female statues, we assume of some deity. With chanting and much animation these were hoisted into the air, often twirled around several times before been cast into the sea. Here are a school class preparing to do just that. In what is a relatively poor community, it seemed strange to see such beautiful figures been cast adrift. 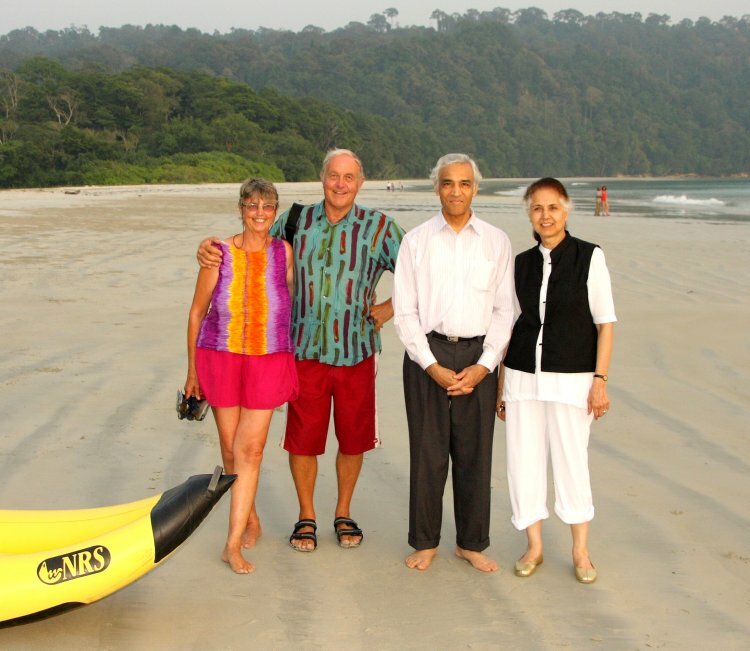 We left the Andamans on the 6th February, just short of our allotted 30 day allowance. Again the bureaucracy involved was time consuming and completely out of proportion to a visit by a sailing vessel. Around an hour before dusk and thirty hours out in mid-ocean at a position of 10°34'N 95°11'E, in waters around 2360m deep, we had a most unusual encounter. 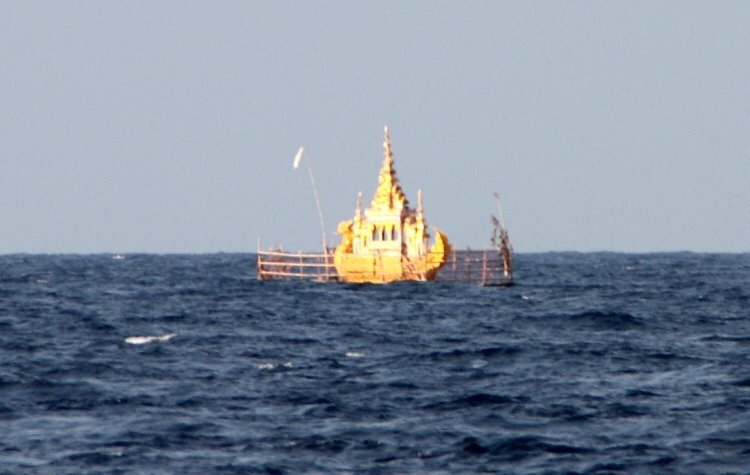 This floating temple complete with fence and flag is probably the most amazing object afloat we have ever come across. The picture was taken from about 750m away so is not of pristine quality but at least demonstrates we were not under the influence of some hallucinating stimulant. We guess the platform was some 20m square so it was lucky we passed it by in daylight rather than running into it at some speed after dark. 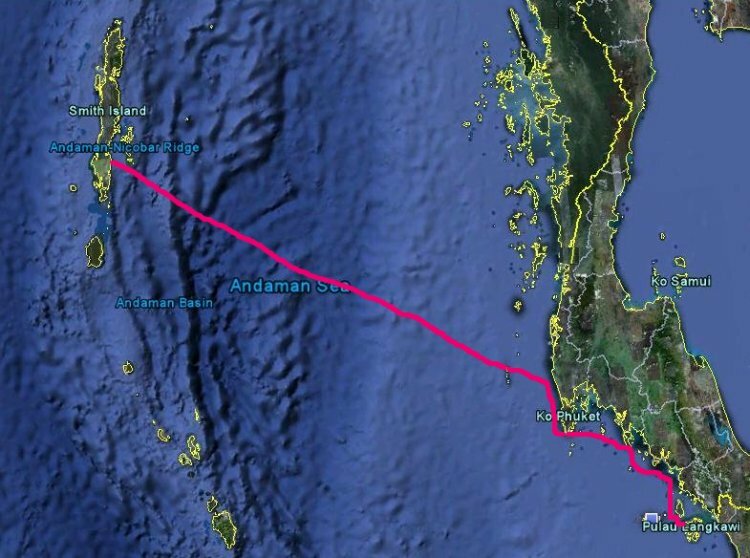 Here we have included some images from our trip down from Phuket to Langkawi, a voyage of some 150nm which we normally spread over five or six days, calling at some of the multitude of small islands on the way. 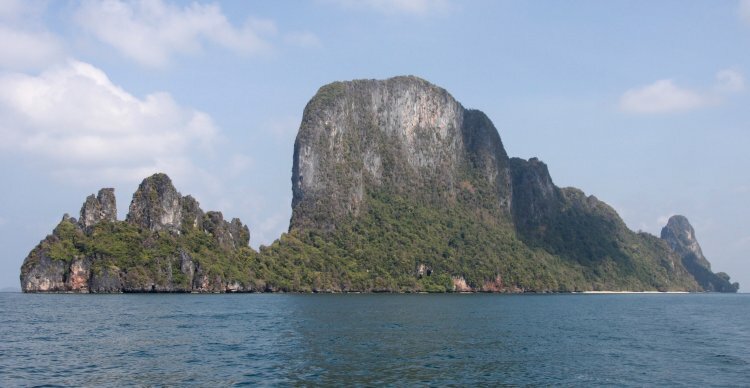 Below is Koh Phetra, Koh being the Thai for island and Phetra pronounced without the 'h' (the letter 'h' is used frequently in Roman numeral written Thai but never ever pronounced - as in Thailand itself). Phetra is a karst limestone knife blade sticking out of the sea being around 3km long but little more than 100m wide. Nevertheless it makes a good if rather daunting place to anchor for the night. There is no time for slacking aboard, even when on passage. 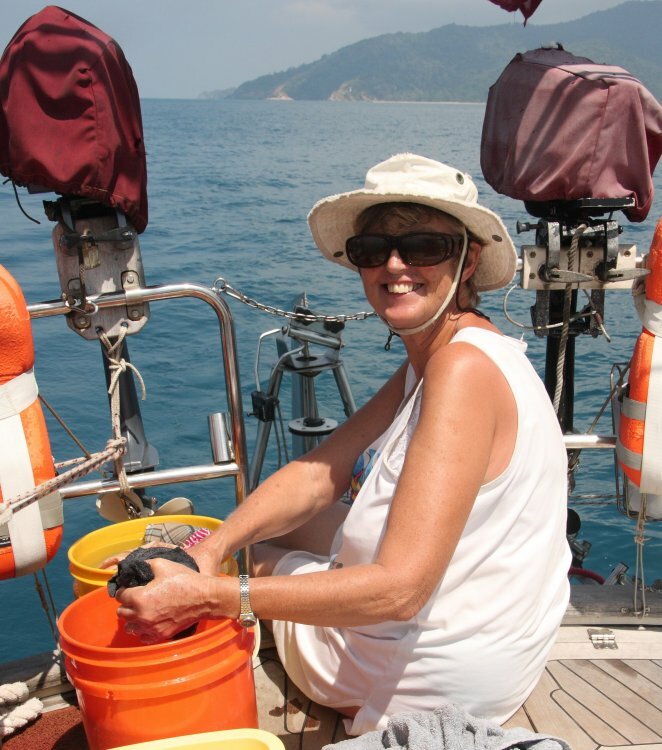 Here is the first mate is on the aft deck doing some washing as we head south from Koh Lanta. This is a large island, just a short ferry crossing from the mainland and is very popular with Swedes, many of whom have second homes there and where they have even set up Swedish schools for their children. The ship below was taking on bulk cargo, possibly gypsum from barges using a crane mounted bucket which seemed incredibly slow even though it does have five cranes. What was unusual is that it was over 12nm offshore as the coastline there is not deep enough to get any closer to the shore. There is a very shallow river entrance that the barges can negotiate near high water on a rising tide. The large barge below was behaving very strangely as we approached it just north of Phetra. We then noticed there were two fork lift trucks aboard casting skeletal concrete cubes over the side at a rate of one every 3-4 minutes. The structures are around 1.5m sided cubes and we are unsure what their purpose is. 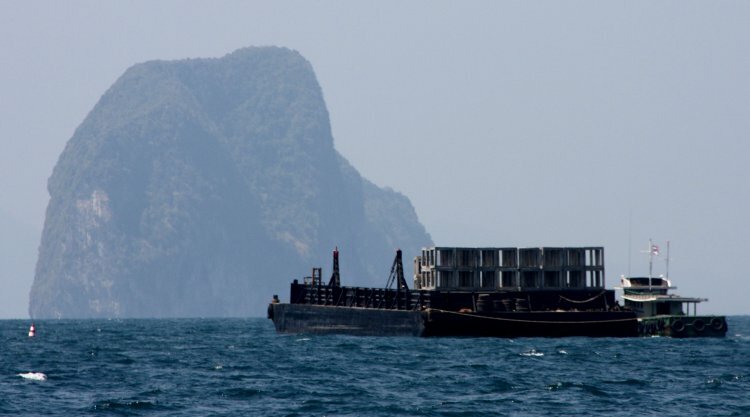 They water is only around 14m deep thereabouts so they could be attempting to generate a habitat for marine life or might even be a laying a deterrent to net fishing which is very widespread in Thai waters. Finally, just off the island of Tarutao which lies just inside Thailand on it's southern border with Malaysia, just north of Langkawi, we came across this impressive trawler in a fairly restricted passage. See how labour intensive recovering the nets is, there are even guys over the bow at sea level. The mesh of the net does seem very fine too, perhaps there aren't any restrictions in these waters. 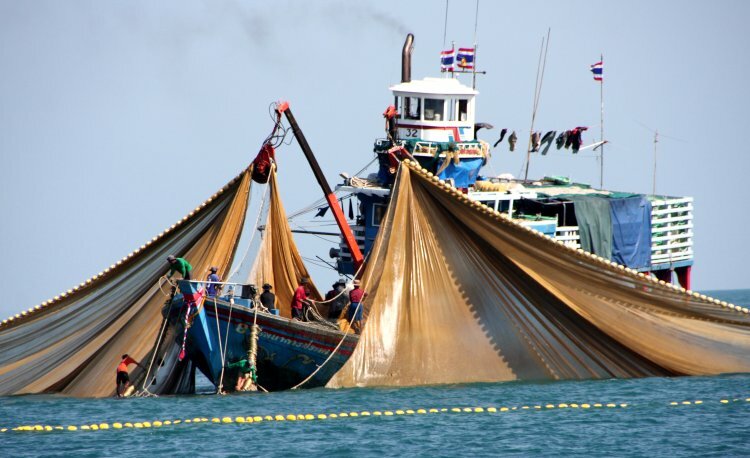 Fishing activity all along the Thai coast is extremely intimidating to sailing boats with scores of pair trawlers around at any time, and also net and pot buoys spread around liberally, often only a 100m or so apart. Making a night passage is therefore to be avoided at all costs. Amoenitas is now back in Rebak Marina off Langkawi, Malaysia whilst we are back living in our home Greenacres in the New Forest in southern England for six months or so to sort out some more substantial internal renovations. We expect to have another, probably quieter season in 2010/11 when we may do some preparation for the long trip the following year across the Indian Ocean to the Red Sea and through the Suez Canal to the Mediterranean. So, we could be back in Europe in 2012........or maybe not!